1. Get your fireplace inspected. According to a survey, by National Fire Protection Association, last year an alarming 42% fires in the country were credited to home heating fires. They suggest to have your chimney swept once a year to remove all of the soot and debris (building smaller fires will prevent build up in your chimney, and prevent cracking in the mortar). So make sure you call a local chimney sweep and have them come out to take a look, before you use your fireplace this fall. I have had some clients work with a local chimney sweep (Taney county area) R&L Chimney Sweeps and have had wonderful experience. They do professional work for a reasonable price! 2. Check chimney for cracks and loose bricks. Ash can escape through these cracks, and could potentially start a fire in or outside the home. The fireplace cap is located on the top of the chimney, and looks like wire mesh around the top, and on the inside rim. This is the part of the fire place that takes the most damage because it is always exposed to the elements. The chimney cap is there to make sure the air is filtered against rouge ashes, and to keep animals out of your home. This reminds me of the commercial for All State about the raccoon (mayhem) in the attic. Don’t let that be you! 3. Be sure that you are burning the right wood in your fireplace. Lets first start with the not to burn list. Do not burn freshly cut wood. 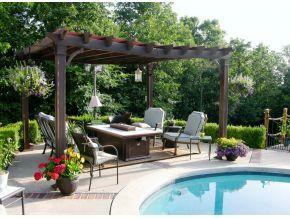 This type of wood has more moisture, and produces more smoke than heat. Synthetic logs are a do not use because they can burn unevenly, and produce carbon monoxide. Which leads to my next tip. Make sure that you have a carbon monoxide detector inside your home. The perfect type of wood to burn is “seasoned” wood (wood that has been stored in a dry place for at least 6 months). 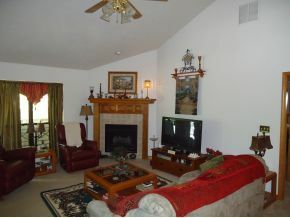 Speaking of fireplaces, we have tons of homes on the market with fireplaces! 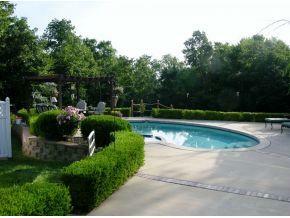 One of my favorites is this gorgeous ranch style home in Branson Missouri. 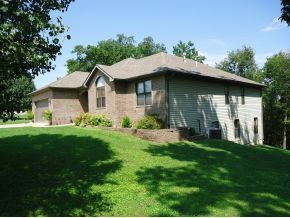 Plenty of room in this 5 bedroom 4 bath home situated on 3+ acres backing up to conservation land, is only 10 minutes to Branson’s northside shopping! 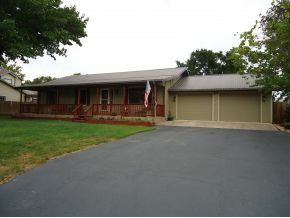 This beautiful home is located within the Branson School district. 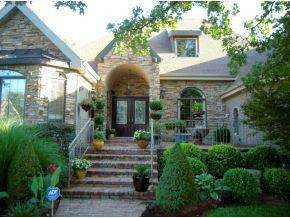 Beautiful brick front, and spacious living room with vaulted ceilings and cozy fireplace. 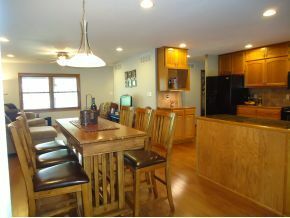 Nice walkout basement, large walk in cedar closet, formal dining room, oak cabinets in kitchen, and 24′ x 24′ workshop. A must see for those wanting a little more space around them! 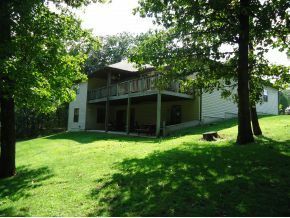 Interested in seeing this home on person? Feel free to contact us and set up an appointment! First things first; we needed to take down the wallpaper border. As we tried to just peel it off we noticed that we were only getting the top paper layer off. Fortunately my mother-in-law had taught me how to make a mixture that would help us peel this off effortlessly. 1/4 Cup of Fabric Softener (I use snuggle-fer breeze for best smell and results) in a spray bottle (from the dollar tree), followed by filling up the rest up with warm water. After putting both into the spray bottle, make sure the spout is turned off, and shake for about one minute. Spray directly onto the surface of the wallpaper, and let soak for a minute. When you come back and grab a corner, it should peel right off. Make sure you have a scrub brush for the few stubborn places. This room was also used as a mancave for the previous owner, so it has been smoked in for the past 5 years or so. 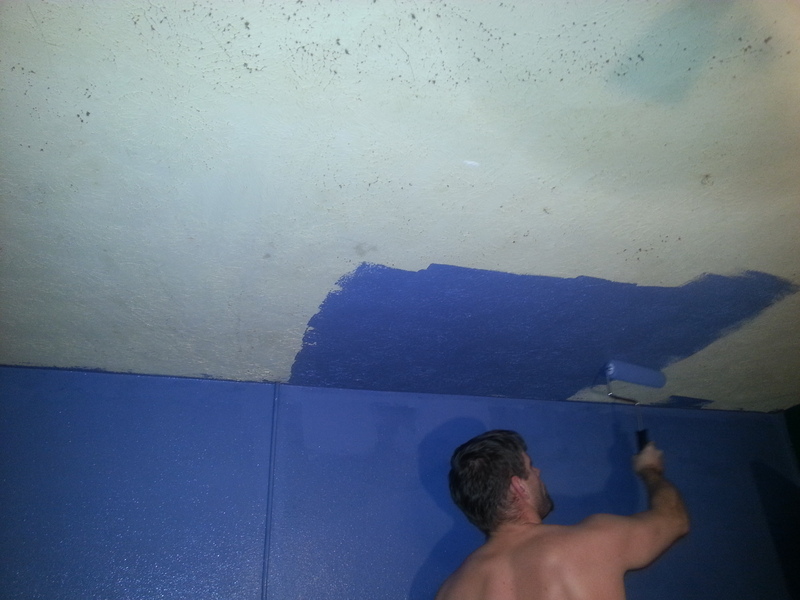 So to prep the surface for the paint, we took a rag and used the same fabric softener/water mixture to scrub down the walls. 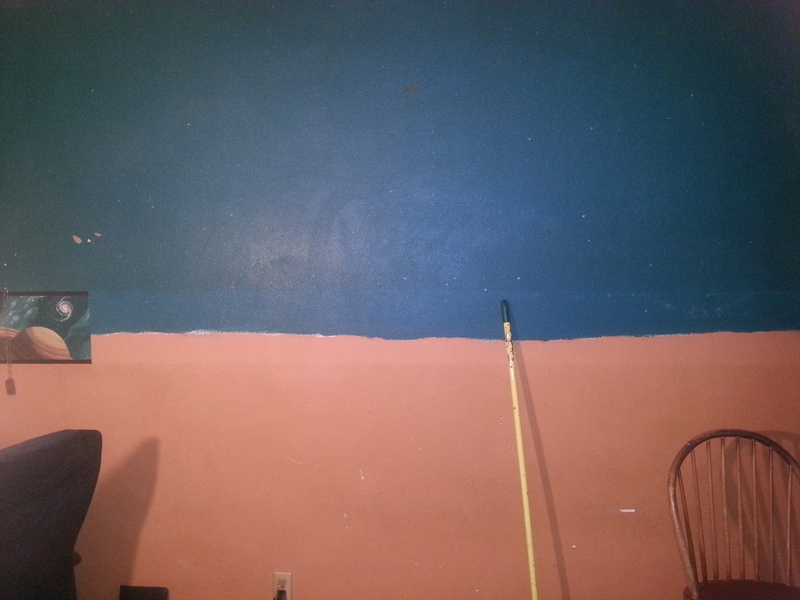 After getting all the nicotine off the walls, it smelled so much cleaner and fresh! My personal favorite part of painting is taping. I swear that it is therapeutic in some way. 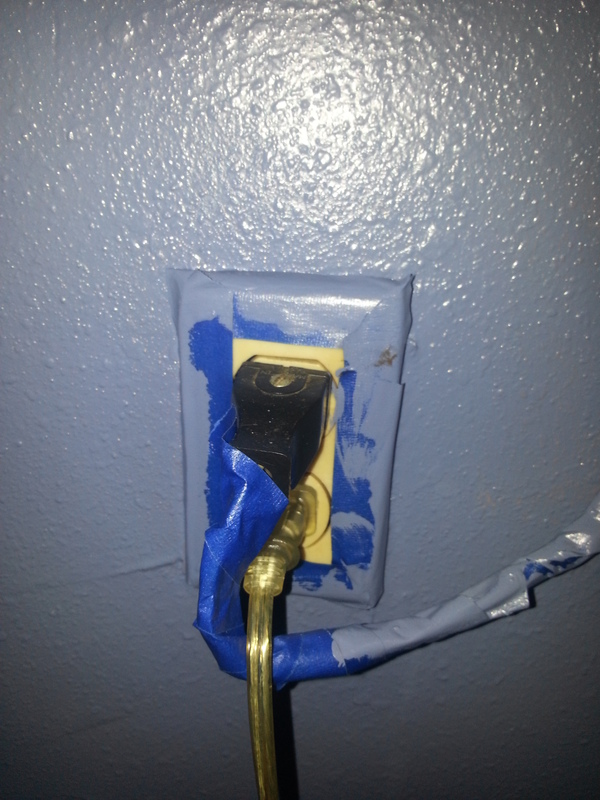 Some people take off the trim, and socket covers to paint, but I prefer to cover them in tape. It is faster, and you are still ensured not to get paint on anything. We strictly use the Scotch Wide Blue Painters Tape you can get from Lowes. Using any other type will peel the paint off when you remove the tape at the end. Thank goodness they decided to paint the walls something a little more neutral. 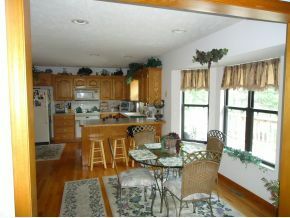 A major plus for when they decide to re-sell their home, they wont have to re-paint this room. Keeping walls a neutral palate help you in decorating your home, and creates a warm environment for buyers to come into. 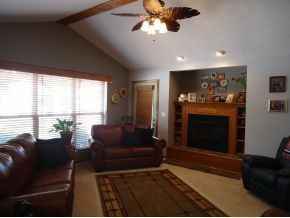 They chose a dark navy-type color for the accent wall and ceiling. 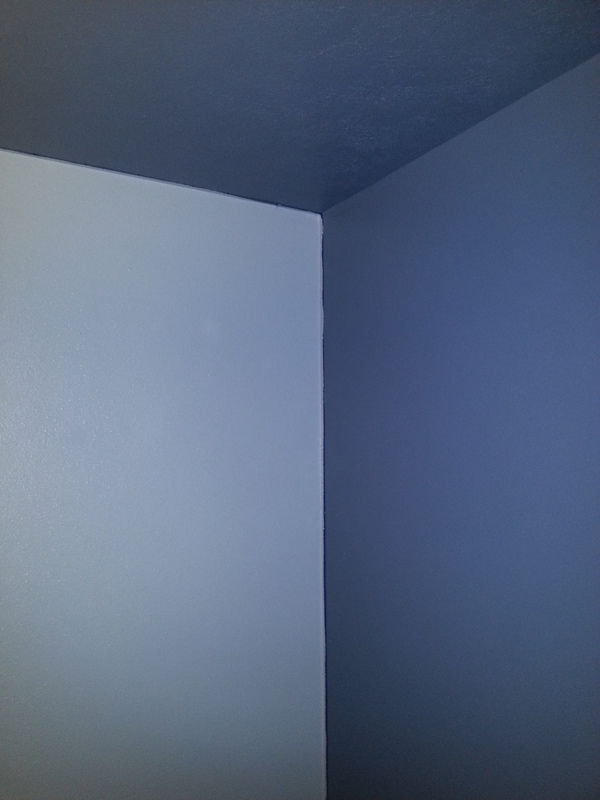 On the other three walls, they used a blue that was 3 shades lighter than the original color. 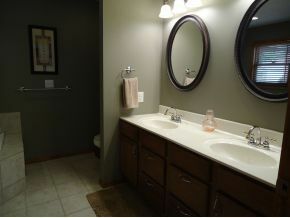 This unified the room in color while still giving it an accent wall. Four Hours, Three cans of paint, Two paintbrushes, Two rollers, and Three coats of paint later; We have finished the room! 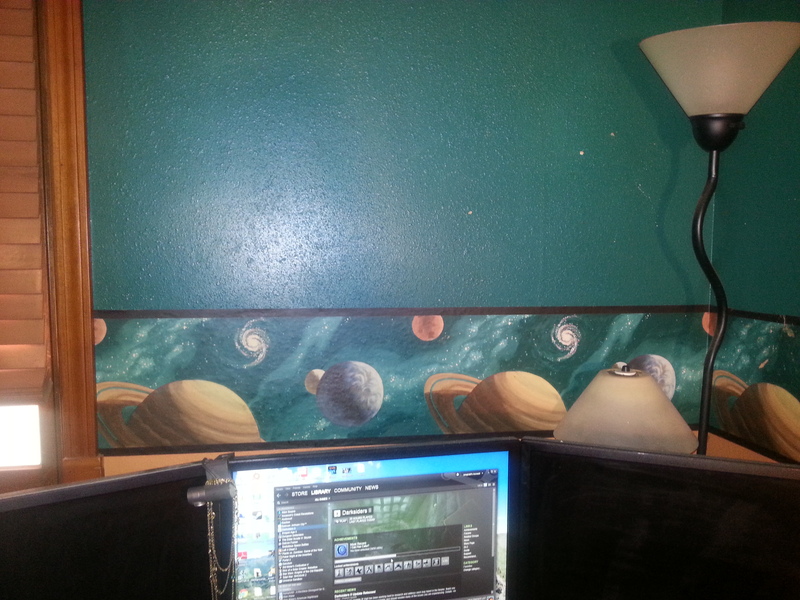 It doesn’t even look like the planet infested man cave that it did before! 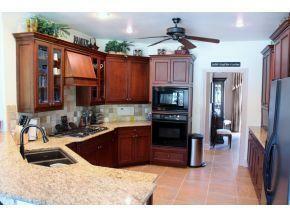 It has been transformed into a sophisticated media room that can be used to entertain and relax. New Blog coming soon on how to remove smoke and grime from a room!